The men in our lives are sometimes the most difficult to shop for during the holidays. Tools and ties, gizmos and gadgets, navigating the mass of items marketed to men can be overwhelming to say the least. Breathe easy. If you are playing Mrs. Clause for a fashionable guy, or one who could use a little help in the fashion department gifting your guy a tres chic ensemble will ensure that your main man looks and feels great this holiday season, and that you have a dapper don on your arm to boot! 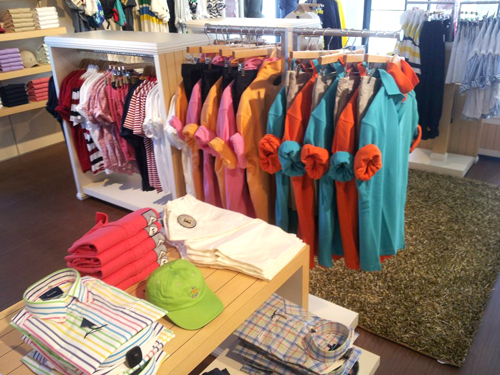 For years I have heard Bahamian men lament about the bevy of boutiques carrying womens-wear compared to the handful of stores men can shop for quality apparel. In recent times, more menswear boutiques are popping up and I was excited to attend the launch of his fashion two weeks ago, a refreshing men’s boutique located in the Old Fort Bay Shopping Plaza offering ‘island chic’ pieces for men. Clean and simple merchandising makes the boutique a pleasure to shop and a great selection of top brands makes it far too easy to cross off every guy on your list in no time at all. I chatted with Etienne and he gave the 411 on his fashion and his top fashion picks for the Holidays and Spring 2013. What brands do you currently carry in the store? Are there plans to introduce new brands in the coming months? We launched with the following brands: Tommy Hilfiger, Nautica, Faconnable, Kenneth Cole and Calvin Klein. We carry men's clothing, accessories and footwear from these brands. We also carry fantastic men's gift items. In the New Year, we will be adding styles and accessories from Robert Graham and Daniel Cremieux. What is the general price point/range of the pieces you carry? Our t-shirts, in most of the brands, start at just under $40. 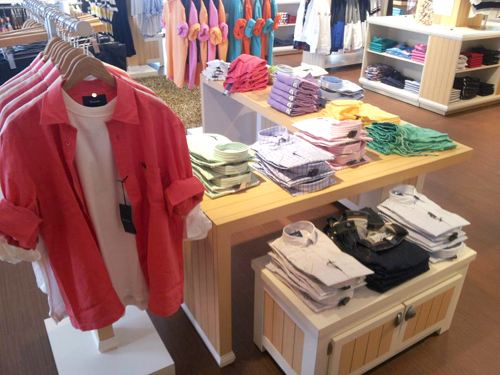 Our basic polos in Tommy and Nautica sell for about $60. A fashionable dress shirt in most of the brands is about $100. In short, we're very competitive with US prices and we aim to keep it that way. We know that Bahamians want to shop locally to support our economy, especially for their clothing, where feel, touch and fit are so important. What are your top 3 menswear trends/pieces for winter 2012? This Fall/Holiday season is all about effortless style, especially in men's clothing. Guys want to look good, but they don't want to have to put too much effort into shopping for their look. Long sleeve plaid and stripe button down shirts are popular this season. Of course, Fall/Holiday is all about denim, which we offer in the latest washes, styles and fits from every brand. No look is complete without accessories and this season we're focusing on stylish scarves, quality leather bags and amazing shoes. his fashion excels at effortless style because you can find chic accessible fashions all under one roof. What items can we expect to shop for spring? 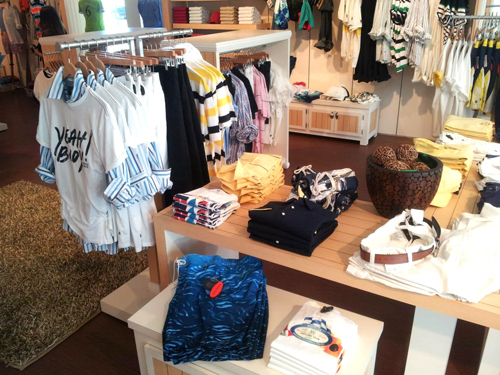 In spring, we'll be featuring fresh colours and fabrics and great attire for our tropical weather. We'll be offering a strong presentation of linens in all brands and we'll be offering coloured jeans, shorts and trousers. Of course, it will be time to head back to the beach, so we'll have an amazing swimwear presentation. This is the Bahamas, so vibrant colours are always appropriate for the islands. What is your favorite line/brand out of the ones carried by his fashion? Honestly, we would be hard pressed to pick one, because the entire idea of the store was to feature brands that each told their own story, so that our customers could find something they like for almost every occasion. Tommy Hilfiger works with amazing colours and quality fabrics and really does day wear well. Nautica is terrific because it's inspired by the sea and is thus ideal for island living. Faconnable exudes a sophisticated elegant chic and its bold, yet subtle, use of colour is inspired by the lifestyle of the French Riviera. Kenneth Cole is moody and dark with hints of purple and a lot of grey, black and white, perfect for a night on the town. Finally, those who are in the know, know that Calvin Klein Underwear is the number one brand of men's underwear in the world. What have been your main challenges thus far? Our biggest challenge, thus far, was finding a selection of men's brands that were unique in their own right and could be placed next to one another, yet be clearly different. Basically, we didn't want to have a lot of overlap between the brands, which is difficult to avoid in men's clothing, because it tends to be more commercial. We spent several years researching and many trips to various parts of the world selecting carefully to grow our brand portfolio. We think our team succeeded with the various brands they selected. The most important thing to remember about fashion, even when it gets serious, is that fashion is fun and its about style and life and love. You have to feel it.